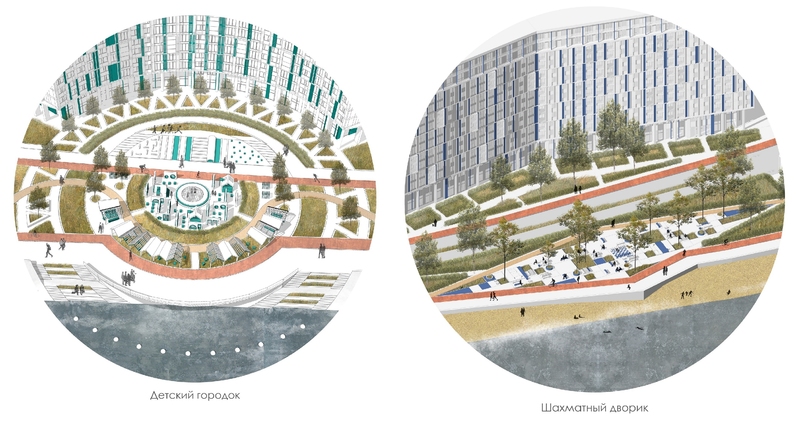 The idea of a “Marine Façade” of Saint Petersburg built on the city’s alluvial waterfronts, is as ambitious as the project of the Lakhta Center tower: although the building did not become “Europe’s highest skyscraper”, as was originally intended, it is still reputed to be “the largest integrated land development project”, “the visiting card”, and “the city’s face” that meets everyone who comes to Saint Petersburg by sea. The new lands are increasing the area of the Vasilyevsky Island by about a fourth: the city is planning to make a total of about 450 hectares of them, out of which amount about 170 hectares have already been washed up along the Morskaya Waterfront. In 2006, Gensler developed an aggradation master plan, according to which the northern part of the manmade island was to become the business one – similar to Manhattan or Shanghai – with super-dense construction and peaks up to 200-300 meters, whilst the southern part was to become a residential one. 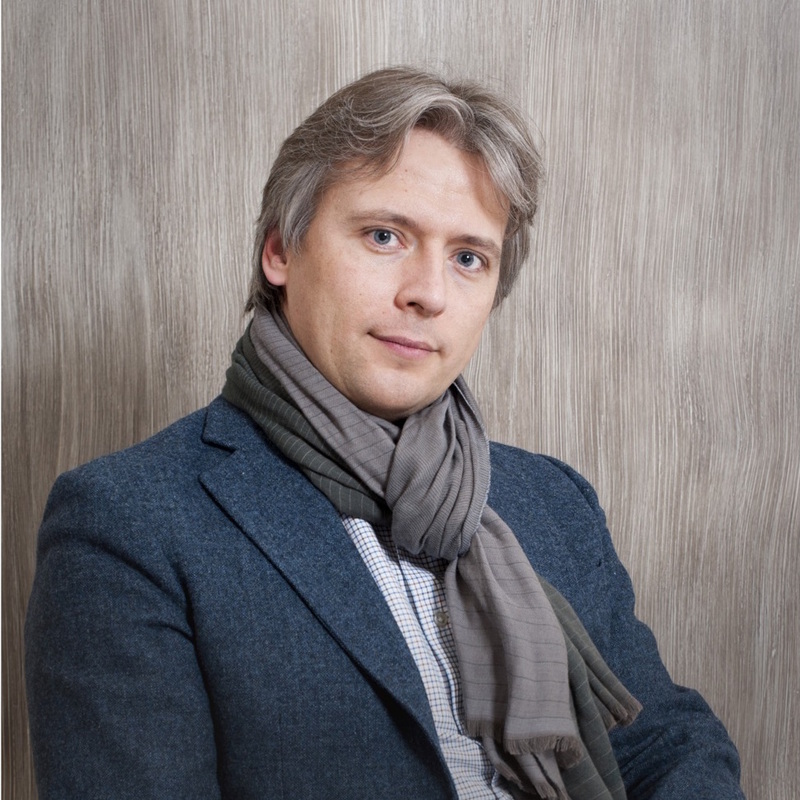 In 2014, the city approved of the project of planning the alluvial lands, developed by the company “Soyuz-55” headed by Alexander Viktorov. He made substantial changes to the original Gensler concept: the manmade island merged with the mainland, the construction significantly decreased in height and became exclusively residential. The Site Plan Committee, which has the power of law, also defined the composition of the city block construction in the southern part of the aggradation – with buildings standing along the perimeter, and schools and kindergartens situated in the middle of the city blocks. 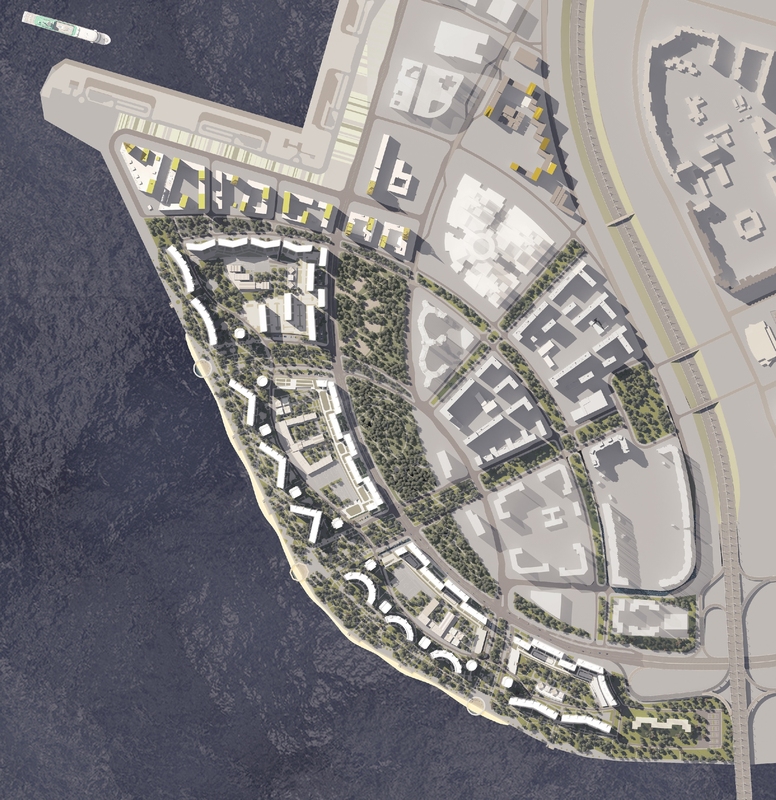 In the Gensler master plan, the residential houses stood with their side ends facing the water, which made the city blocks literally windswept through by the chilling winds blowing from the Gulf of Finland. The development of the alluvial land began from building the transport infrastructure. The first to appear was the sea passenger port capable of receiving cruise ships of any size. Then the mainland and the alluvial land got separated by the Western High-Speed Diameter, to the west of which appeared the first stage of “Me, Romantic” housing complex, which was also traversed by the Western High-Speed Diameter. 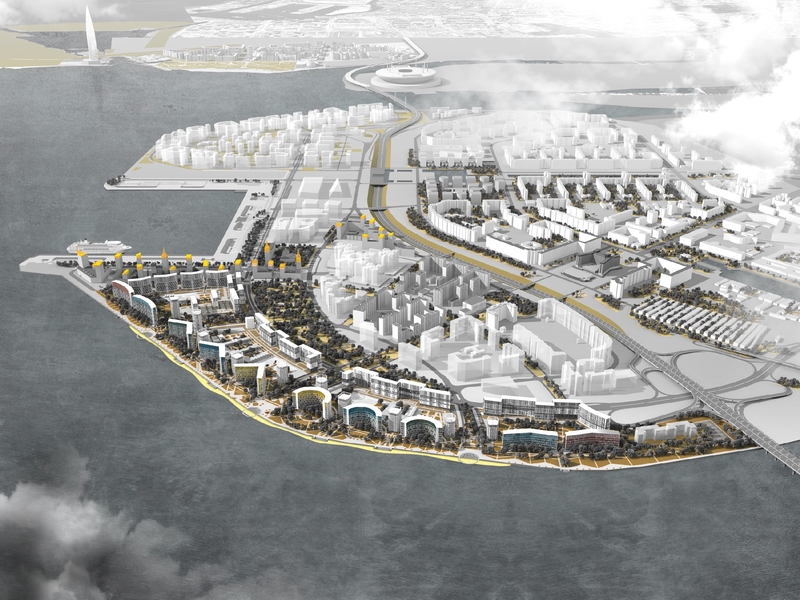 In 2015, a large international competition was organized for the best concept of developing the territories surrounding the port bay, which was won by the Dutch company KCAP Holding B.V. & Orange and Saint Petersburg’s “A.Len” with their Golden City project. Coming after it, the development of the rest of the waterfront will be continued by a large-scale housing complex designed by “Studio 44”. 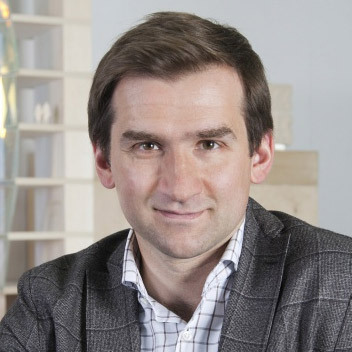 At the Urban Council meeting, Nikita Yavein shared that the master plan project left virtually no room for architectural maneuver. Considering other restrictions, from the required output of square meters to the strong sea winds and the stipulated construction concept, “Studio-44” dialed in a special configuration of the buildings. The city block will consist of four layers, and its structure will look like sand hills under water or the actual alluvium – as if each line appeared after a series of waves lapping the shore. Closer to the city, the architects placed the “boulevard front”, followed by a yard belt with schools and kindergartens. The third line is a punctured line of towers and slabs designed in the form of “birds” and “lenses”, freely hovering around the park, which becomes the fourth and the last line. It must be said that the park might not have happened because in the planning project of the territory there was a highway running along the shoreline. 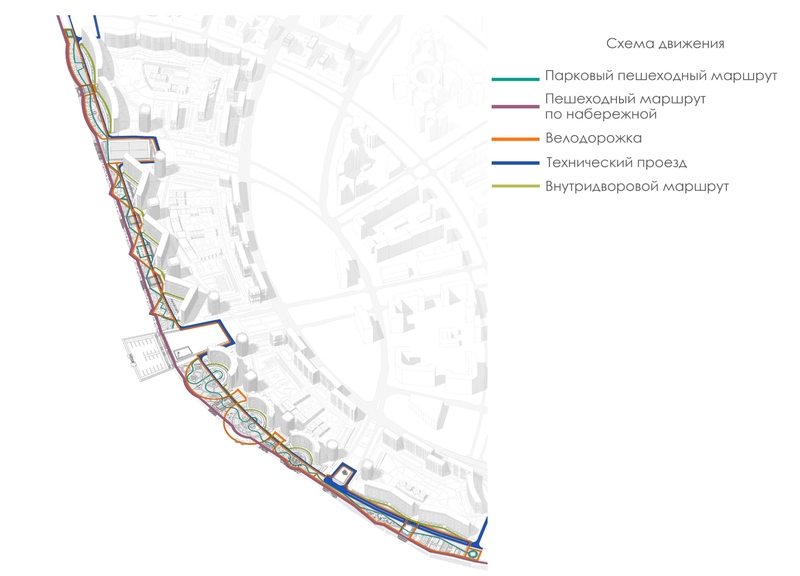 When the land site was bought out by LSR Group, it proposed “a new line of the Vasilyevsky Island” (a park one), and “Studio-44” was able to include it in the project by rearranging the traffic streams. 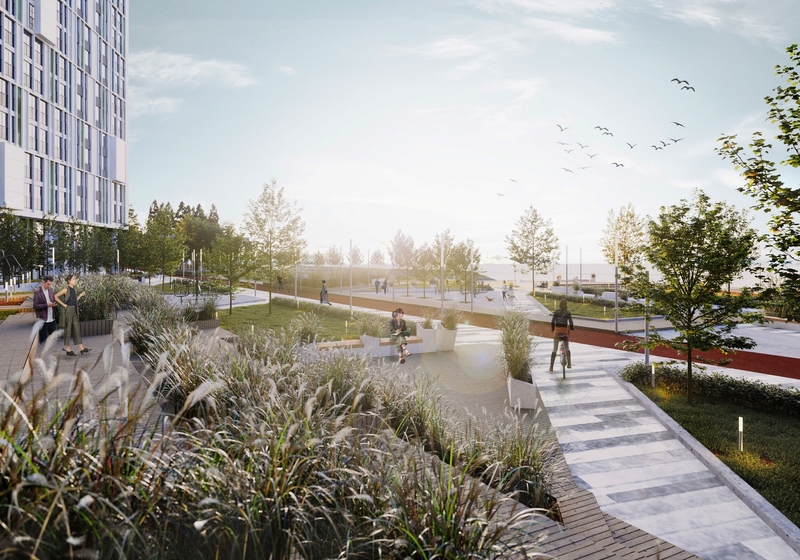 There was a special competition for the landscaping project of the shoreline, the first place in which was also won by “Studio-44”. The park is about two kilometers long, its width varying from 40 to 150 meters, its total area being a little over 11 hectares. 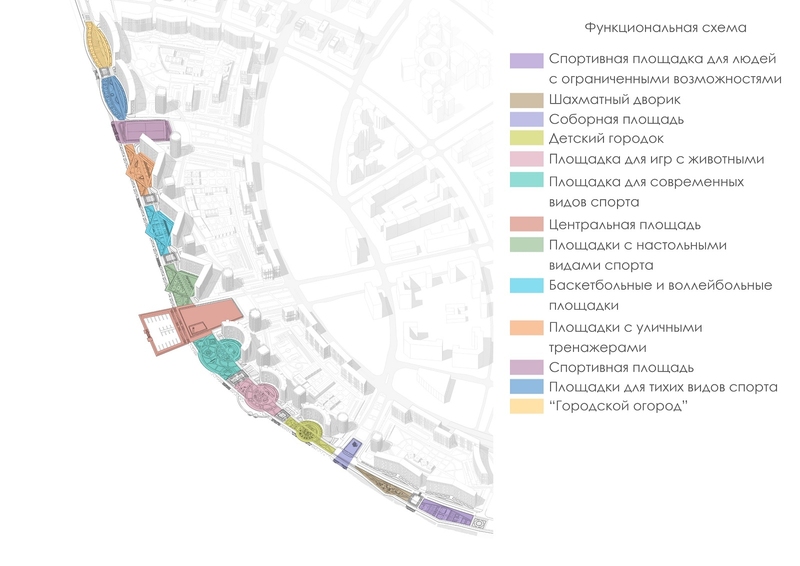 In the interpretation of “Studio-44”, the park ended up being not of the “landscape” type, as was proposed by most contestants, who associated this place with the dunes and pine trees of the Kurortny (“Seaside”) district, but, rather, of the urban type. Since back in the day, the granite embankments turned this chunk of swampy land into something opposed to nature, here we are seeing pretty much the same thing – and the fact that it is a piece of manmade land makes it even more appropriate to speak in the language of straight lines and motivated functions. Nature in this case IS the landscape design; it only adds to the beauty of this public area. If we are to describe the park in a nutshell, it is essentially an enfilade of ten smaller parks strung upon pedestrian and bicycle trails. Each of these “sub-parks” belongs to a certain house – to a certain extent, each park is a continuation of a building’s yard; the parks are even outlined from the opposite side with a contour that reflects the building’s shape: arc-shaped or triangular, which indicates the fact that this park belongs to this building. In many cases these outlines form small “balconies” hanging above the water like a sign of expansion of architectural form beyond the confines of the shoreline. On the other side, however, all of the “park” yards are open to the water and are strung on a single axis. Each of them has its own special design, function, mood, and scenario. Passing through the entire string, one can collect the impressions or choose for themselves a space that best fits their mood today. “Moving through this string of gardens of different types aligned along the shoreline, you feel as if you pass from one world to another” – Nikita Yavein says. 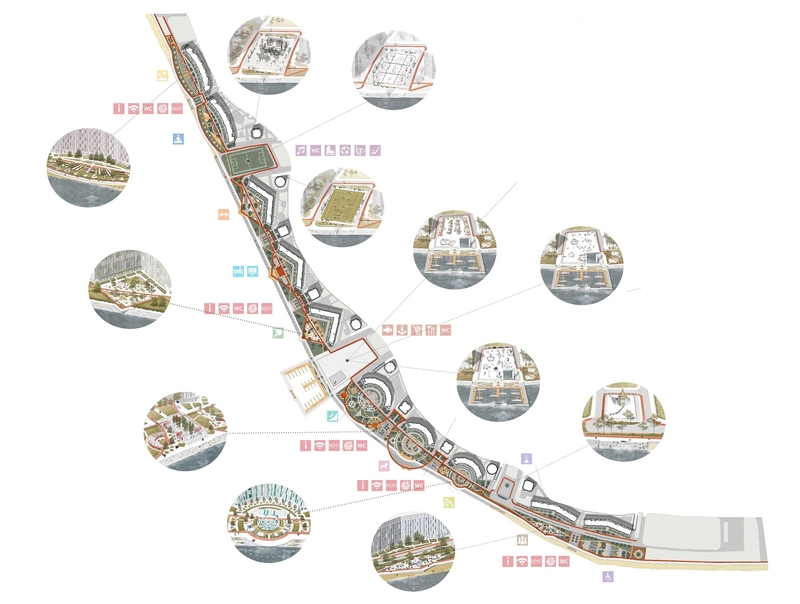 The idea of a linear park is not exactly new – on the contrary, it is very popular nowadays because it is equally applicable to a boulevard and to a waterfront. The change of impressions and diversity of green “rooms” to be found within one and the same landscape is also virtually a classic, necessary to liven up one’s perception, even though it sometimes comes about not intentionally but historically, for example, when a French and an English park are joined together. The idea of alternating different nature fragments serves as the basis for designing botanical gardens around the world. Still, it is a rather rare case when landscape structures, however linear, end up being organized in such a saturated and long sequence. 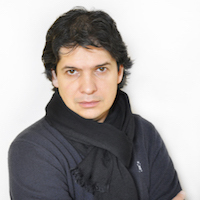 The solution proposed by “Studio-44” is arguably unique not only for Saint Petersburg but also for the entire global practice. Most likely, it is the result of the hybrid territory that formed here from a series of yards and the linear waterfront park. The four major blocks are separated by three squares. In the very center, along the axis of the Nakhimova Street, lies the large market square with a pond in the middle of it. This is a meeting point and a place for celebrations, festivals and market days. The architects dream that in the future small boats will moor here, from which the guests of the park will be buying fresh-caught fish. 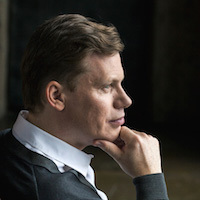 Closer to the Golden City will lie the Sports Square, and from the opposite southern side the architects are proposing to make a Temple Square: currently, the nearest church of the Pardoning Icon of the Holy Mother, is about four kilometers away from the aggradation. Since the park grows wider in the middle, this is the place where the noisiest and the most active zones are concentrated: various sports fields, a playground, and a special area for playing with pets. Behind the Sports Square, one will be able to do “quiet” sports such as yoga, gymnastics or pétanque, as well as tend a vegetable garden. Behind the Church Square, there will be a chess yard and a sports field for people of limited mobility. It is also worth noting that the whole territory of the park is barrier-free, and one can easily pass through it on a bike or with a go-cart. All of the venues are pierced by a few pedestrian and bicycle trails: one can choose the shortest possible way or walk along the water’s edge or the winding park trails. One’s walk is made still more eventful by “three-leaf-mirrors” between the level spaces of the theme parks. They mirror the points of the towers, being essentially platforms with colonnades, into which one can install various modules – cafes, rental points, toilets, and more. Also, local businesses will occupy the bottom floors of the residential buildings, along which runs yet another “yard-side” route. Between the “three-leaf-mirrors” and the towers, there will be a strip of trees planted closely to one another, whose function will be to stop the chilly gulf winds. In these points, one will also be able to get down to the water. The relationship between the future park and the water can best be described as reserved. For example, Peterhof, which can be seen from the new alluvial land directly across the gulf, is world famous for its fountains and water tourist attractions. There is also a new city space called “Port Sevkabel” that interprets the navy theme with various beacons, ship’s decks and bull’s eyes. The 300 Anniversary Park meets the water with a wide strip of beach sand. The park designed by “Studio-44”, on the other hand, treats the water element with politeness and respect: the embankments are safely reinforced with granite, the circular bridges, albeit hovering above the water, still do not let pedestrians and cyclists to wander too far away from the land, the number of descents to the water is limited, and the beach could only be made on a short fragment of the shoreline for purely technical reasons. But then again, the slightly “introverted” character of the park in reference to the water can be explained first of all by utilitarian reasons: on the one hand, this part of the alluvial land comes under the impact of both sea waves and spring ice floats. On the other hand, the competition specifications only provided for working with the land, whilst beyond the breaker line federal property begins. At the same time, the square of the moors that protrudes into the water area – a long promenade swept by the sea breeze and commanding fine views of the gulf and the sea sunsets – slightly improves the situation. If we are to try and classify the park that ended up being here, this is not quite a pleasure garden, not quite a “study” garden, like the Summer Garden, and not a natural installation in the spirit of Moscow’s Zaryadye Park. At the same time, it took a little bit of something from all of its predecessors: you can see here a few bits of “Paradise” park, and regular structure, and a bit of a vegetable garden. 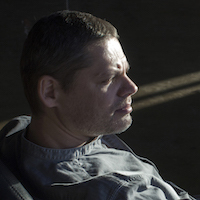 The original ideas from other projects of “Studio-44” are also developed here. 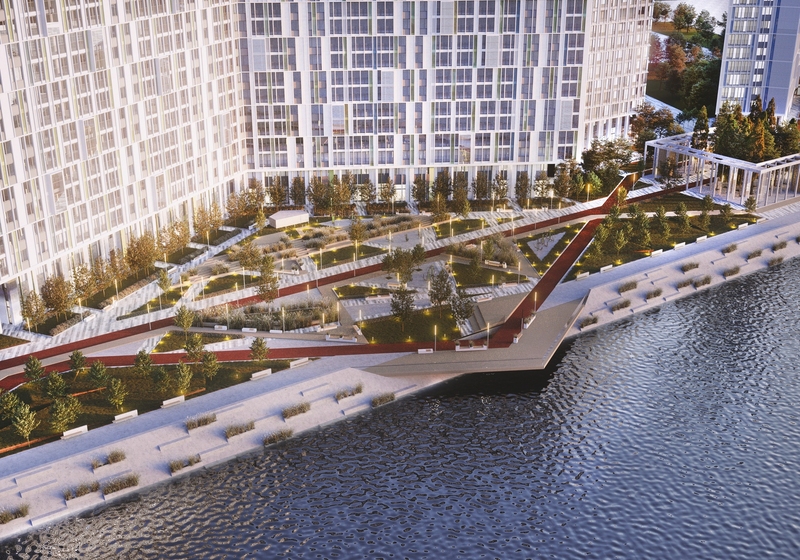 For example, a linear park running along a railroad line is now being built in the housing complex “Galactica”, while the project of the European Embankment Multi-Purpose Complex also involved squares and rectangular ponds. The Park line of the aggradation can best be described as a “public territory” because everything here is designed in such a way as to make it possible for all kinds of people to come down from their top floors, go outside, do something that they enjoy doing and even – what an unusual scenario nowadays! – meet one another. This is a place where seemingly forgotten scenarios come alive, where high school students roam in flocks, people go for a stroll after supper, a grandpa teaches his grandson how to fish, and a grandma teaches her granddaughter how to dig the weeds. Or still more ancient – two housewives are arguing over a fat bream or an appetizing smelt on the market square. In this sense, the park does make the alluvial land new because no similar space – a large-scale high-quality piece of environment situated next to a residential area – is to be found anywhere else in this city yet. 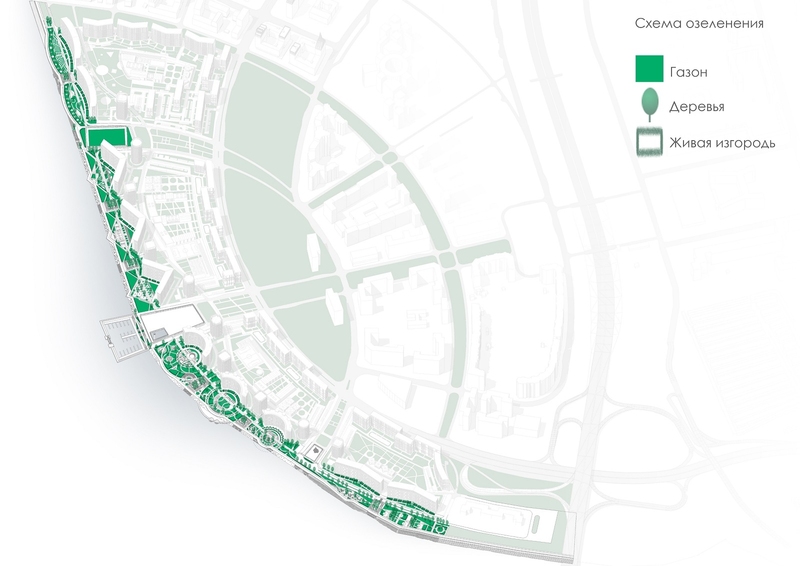 The park will become a part or the future green framework of the Vasilyevsky Island; according to forecasts, it will be visited by ten thousand people daily. The entire complex is due to be finished by 2028.